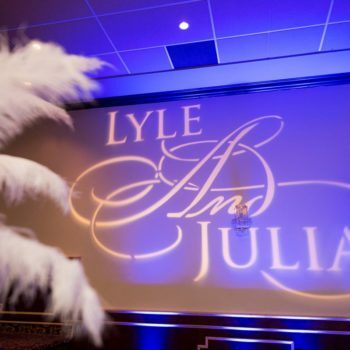 Custom gobo projection is the easiest way to personalize your event! Whether its your monogram, or company logo, there is no better way to brand the event. Drawing on the walls, without getting in trouble. A gobo projection is a stencil that is inserted into a high powered projection light. It then displays this stencil in a very large format on the wall of your choice within your venue. A gobo projection can be projected on just about anything, other than glass walls. The darker the area the gobo is projected in, the more dramatic and accurate the gobo looks. Gobo projection can be done indoors and outdoors. It is very likely that we have done gobo projection in your venue before, if you don’t know where to place it, just ask us. With a custom gobo projection, the possibilities are limitless. You can provide us the design, pick from 100’s of our templates, or have our graphic designer create one specifically for you. Displaying your names on top of your head table at your wedding, projecting your company logo in a trade show, a 100 ft projection of the name of your new nightclub on the side of the building…as we said, the possibilities are limitless. Yes, we can color your gobo projection. We place a color gel in front of the projection and the projection takes that color. It’s that simple! Alternatively, you can leave it without a color to get the most vibrant look from your projections. And yes, we have many different colors to pick from!